The Village is proud to announce that under a new agreement, the Grove Commuter Shuttle bus system is now fully funded by Pace and fare box revenues. This means that no Village funds are needed, making the system financially sustainable, per recommendations within the Long Range Financial Plan. 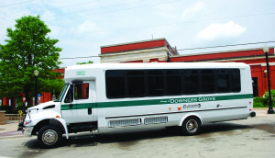 Since FY2000, the Village has received grant funds from Pace to support the operation of the Grove Commuter Shuttle bus system. Beginning in 2010, staff had a series of meetings with Pace officials in an effort to restructure the form of the agreement and to substantially increase Pace's contributions to this transit operation. In 2011, Pace's Board of Directors agreed to amend the 2012 operating agreement to include payment of all operating and maintenance expenses. The Grove Commuter Shuttle provides weekday morning and evening feeder service to the Main Street and Belmont Road train stations.